Employers and clients alike seek out ACCA-qualified members to lead their businesses to sustainable success. ACCA members are strategic thinkers with high ethical integrity, strong financial know-how and incisive business acumen. 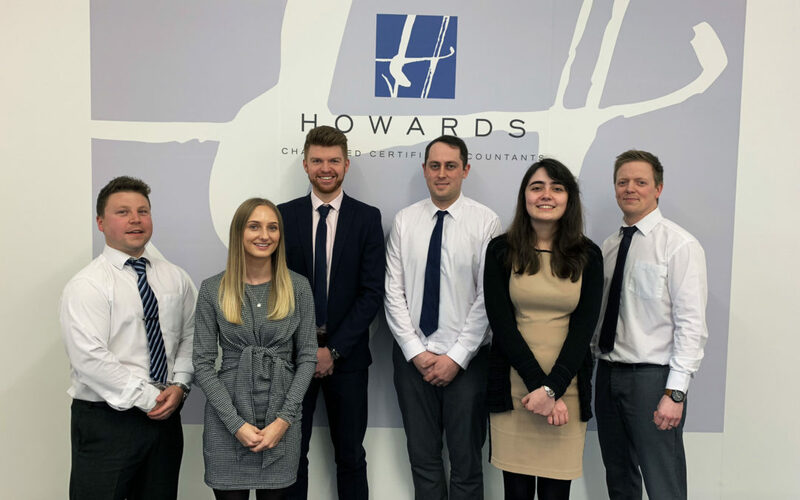 That is why, at Howards, we invest heavily in training to ensure we can offer our clients the best financial and business expertise available in Stafford and the surrounding area. Six of our team are currently studying for the ACCA Chartered Certified Accountancy exams. We are so proud of them. Sophie May (2nd left in photo) is now fully qualified and Nathan, Dave, Joe, Jenna and Oliver (left to right) are getting there! All of them have passed their exams in the most recent ACCA sitting. This qualification sets and maintains the high standards that businesses need to progress. But the path to becoming a qualified professional accountant isn’t easy. The ACCA route includes 11 exams, taking students to the equivalent of a Masters level qualification, and requires three years’ practical experience plus achievement of performance objectives. The initial exams cover applied knowledge and skills which develop the broad and practical finance skills required of a strategic professional accountant in any sector. Meanwhile, the later strategic professional exams prepare students for future leadership positions by developing strategic vision. As a company we have been recognised our investment in our employees, both in terms of training and time. We recently achieved ACCA platinum employer status and were recognised in various business accountancy industry awards last year. We scooped a special, Highly Commended accolade at the prestigious British Accountancy Awards after being shortlisted in the Independent Firm of the Year – Wales and Midlands category. We were also a finalist in the Staffordshire Chamber of Commerce & West Midlands Finance Awards, achieving a highly commended citation for our quality and outstanding practice. “This exam was by far the hardest I have sat to date. The study for the module was quite intense, however as Howards has joined the Level 7 Apprenticeship offered by the government through Kaplan, I was able to benefit from additional online revision sessions which helped me massively. It also helps to have so many experienced members of staff in the office to bounce questions off from day-to-day when you are stuck. “I found studying for the exams quite hard, especially when trying to balance having a social life! Having a lot of staff at Howards to ask for support really helped and reduced some of the stresses of studying. Howards also offers a generous study leave package, which helped a lot. “Studying for the exam was difficult at times to find the motivation, especially finding enough time after work and at weekends! Howard’s gave us time off in order to take the course over five days and then a further two days for studying and the exam.